Beyond the textbook: teaching and empowering, one person at a time. This is the motto health sciences lecturer Taahira Goolam Hoosen lives and works by, whose calling merges teaching and learning with community development to create positive implications for society. 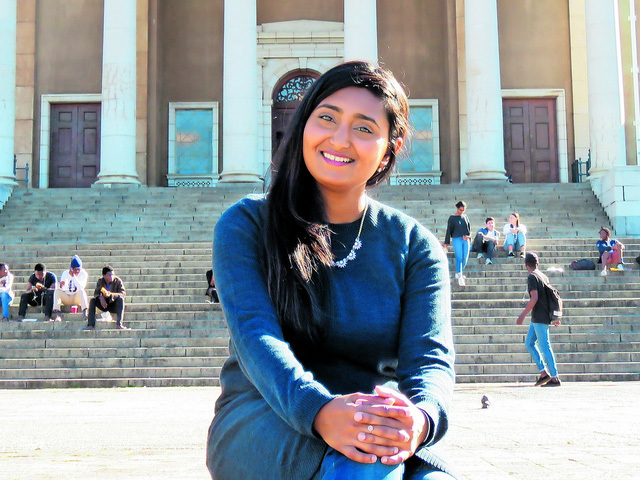 With degrees in human genetics, biology and haematology, it was during her time between honours and master’s that Goolam Hoosen discovered her true academic love was development — assisting students and staff to acquire the appropriate academic discourse required in the health sciences for their success and degree completion. “Acquiring academic literacy is not always formally taught at university. My work explores disciplinary ways to do so, within a decolonised context in the health sciences,” she explains. Goolam Hoosen maintains that the key to success is about being ever curious and challenging, and asking the “why” that advocates higher order thinking and learning. Her work does not end in the classroom. She is also the chief executive of The Humanitarians, a nonprofit organisation which aims to create a sustainable society through health, education, sports, and research. In 2017, the organisation distributed more than 20 000 books to children in underprivileged settings and schools across Cape Town as part of a drive to increase youth literacy levels. Goolam Hoosen grapples with not being able to do more or help more people, but she has realised that assisting one person can have a ripple effect.